There are an estimated 6 million to 7 million Muslims in America whose unique food practices are guided by religious laws and influenced by cultural differences.1 But when it comes to understanding the real essence of these practices, many dietitians are in the dark, which creates a barrier to reaching out to this segment of the population. No one cuisine unites Muslim Americans. The Muslim community is diverse; 36% were born in the United States, while the rest are from 80 different countries worldwide.2 Although the three major ethnic groups in this community are South Asians, Arabs, and African Americans, many have Caucasian, Caribbean, and Far Asian roots. By Islamic law, all foods are considered halal, or lawful, except for pork and its by-products, animals improperly slaughtered or dead before slaughtering, animals slaughtered in the name of anyone but Allah (God), carnivorous animals, birds of prey, animals without external ears (some birds and reptiles), blood, alcohol, and foods contaminated with any of these. All seafood is halal. Muslims are concerned about what is in their food, forcing them to be skillful readers of ingredient lists. Food ingredients that come from multiple sources, such as gelatin, emulsifiers, and enzymes, necessitate the Muslim consumer to do some research to confirm whether they are lawful. Many Muslims choose to eat halal-certified products only, available in ethnic stores, some ethnic and franchise restaurants, and occasionally in mainstream grocery stores located in Muslim-dense neighborhoods. The Islamic Food and Nutrition Council of America provides such certification. Foods mentioned in the Quran, the Holy Book of Islam, are of great spiritual value, and many eating habits are extracted from the practice of the Prophet Mohammad. Olives, honey, yogurt, dates, figs, grapes, pomegranate, and legumes are at the top of the list. Not only do they appeal religiously to Muslims, but their nutrient value is also a plus. Ramadan is the name of the ninth month in the Islamic calendar year, which is based on the lunar cycle and consists of 12 months of 29 or 30 days each. Because the Islamic year is roughly 10 days shorter than the Gregorian one, Ramadan shifts yearly. This year, August 21 marks the first day of Ramadan. Fasting for Muslims means abstaining from all foods and beverages, including gum and water, as well as medication and smoking, from dawn to sunset. The two main meals of the day are suhur (immediately before dawn) and iftar (immediately after sunset). These mealtimes are also related to two of the five main prayers Muslims perform every day. Muslims may consume other meals or snacks at night. Aside from hunger and thirst, Ramadan bestows spiritual peace to Muslims; during Ramadan, acts of worship are highly intensified. It is impossible to describe typical suhur or iftar meals, considering the high diversity of the Muslim American community. Suhur can be dinner, or iftar, leftovers, typical breakfast foods, or ethnic foods. Social gatherings, many times buffet style, at iftar are frequent, and traditional dishes are often highlighted. A few dates and a cup of water are usually the first foods to break the fast, while fried pastries, salads, nuts, legumes, and breads are common. Traditional desserts are often unavoidable, especially those made only during Ramadan. Water is usually the beverage of choice, but juice and milk are also consumed. Soft drinks and caffeinated beverages are consumed to a lesser extent. While weight loss is certainly not the driving power behind fasting, it is not uncommon for some to take advantage of it to shed a few pounds. At the same time, many Muslims see no changes in their weight, while others may gain weight. Excess fried foods and desserts, overeating at buffet-style iftar parties, and reduced physical activity can be attributed to weight gain. Many Muslims aim for nutrient-dense foods to optimize nutrition and see fasting as a way to detox and allow the gut to rest. Fasting does not pose any medical risks to healthy individuals. In fact, Sarah Amer, MS, RD, CDN, says, “The body has the incredible ability to adapt.” She reveals that it takes her only a few days of fasting to get back to her usual activity level. Exemptions to fasting are travel, menstruation, illness, older age, pregnancy, and breast-feeding. However, many Muslims with medical conditions insist on fasting to satisfy their spiritual needs, and healthcare professionals must work with their patients to reach common ground. Professionals should closely monitor individuals who decide to persist with fasting. The main chronic diseases of concern are diabetes, heart disease, hypertension, renal disease, and peptic ulcers.3-5 Care plans must be individualized, as many patients with these conditions can fast without adverse events. Compliance with medications may be an issue, especially for those on daily daytime dosages. 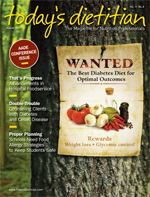 For patients with diabetes, things to consider are feasibility of adjusting medication and insulin dose, clinical stability, history of hypoglycemia and diabetic ketoacidosis, and the presence of other comorbidities. • Help compose suhur and iftar meals that promote more satiety. • Discuss portion control and self-restraint at social events. • Emphasize adequate hydration and limiting sodium. • Help patients manage their weight. • Address constipation issues and tips to increase fiber intake. • Suggest alternate cooking methods to reduce the fat and sugar content of some traditional dishes. • Brainstorm opportunities to incorporate physical activity. • Manage medical conditions on an individual basis. • Assess the need for mineral/vitamin or other supplements. Many Muslims agree that fasting is more mental than physical. Suehyb Alkhatib, a Muslim American from Washington, D.C., believes it is a “lesson in self-restraint and in discipline.” Dietitians have the opportunity to channel this strength to restore their patients’ confidence in their ability to comply with medical nutrition therapies or make lifestyle changes. Effective communication is key when working with a Muslim patient, as it is with any other. Because the American Muslim community is diverse, assumptions can be barriers to rapport while individualized treatments produce the best results. Ask your patients what their eating habits look like during Ramadan, as they would love the opportunity to talk and share. — Nour El-Zibdeh, RD, is a clinical dietitian at Inova Fair Oaks Hospital in Fairfax, Va. She is also a nutrition consultant and a freelance writer. 1. Bagby I, Perl PM, Froehle BT. The Mosque in America — A National Portrait: A Report from the Mosque Study Project. Washington, D.C.: Council on American-Islamic Relations; 2001. 3. Benaji B, Mounib N, Roky R, et al. Diabetes and Ramadan: Review of the literature. Diabetes Res Clin Pract. 2006;73(2):117-125. 4. Perk G, Ghanem J, Aamar S, Ben-Ishay D, Bursztyn M. The effect of the fast of Ramadan on ambulatory blood pressure in treated hypertensives. J Hum Hypertens. 2001;15(10):723-725. 5. Bener A, Derbala MF, Al-Kaabi S, et al. Frequency of peptic ulcer disease during and after Ramadan in a United Arab Emirates hospital. East Mediterr Health J. 2006;12(1-2):105-111.